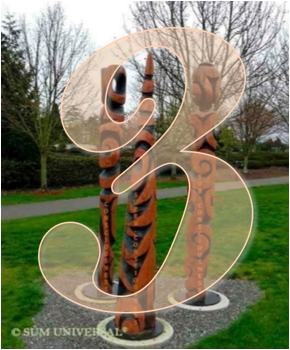 Most cultures regard number three as a fundamental number, for it exhibits the quality of completion. A simple example for its fundamental meaning is one and two make three, three being the result of the action of one and two. Other examples of its fundamental meaning are: the three-fold aspect of so many of life's processes: birth, growth, and death; beginning, middle, and end; past, present, and future. For Christianity, it is represented by the God-Father, God-Son, and the Holy Ghost Trinity. In psychological terms, it's seen as the super-consciousness, sub-conscious and conscious mind. The mystic healers of Hawaii, the Kalunas (Huna), know of Low Self (subconscious), Middle Self (objective consciousness), and High Self (cosmic Self or God within). As we see from theses examples, the number three has the meaning of completion and diversity. The same principle can be observed in physical matter. For example, atoms consist of three parts: protons, neutrons, and electrons. Their existence is based on a dynamic interrelated relationship held together by various forces of attraction and repulsion. The chemical element that correlates with number three is the metallic element lithium, which is a highly reactive metal. It has a silvery-white color and belongs to the group of the alkali metals. Due to its high reactivity it is not found as a free metal in nature. Since it is highly reactive and flammable, it requires special handling, therefore it is typically stored in mineral oil. Lithium is the only alkali metal that reacts with nitrogen to form the compound lithium nitride (Li3N). Lithium metal is the lightest metal and the least dense metal of all solid elements. It is found all over the world in compounds, which are usually ionic. There are many commercial uses for lithium and its compounds. For example, it is used to make special glasses and ceramics, and makes strong lightweight metals for aircraft when alloyed with aluminum, copper, manganese, and cadmium. It plays a major role in the battery technology. Also, lithium has a profound biophysical function and is used as a drug for treating mood disorders.